I’m a firm believer that there’s a book for everyone. Books, even. Just recently I was able to find a book for a reluctant reader that spurred him into making a list of future reads. It took me four months and it was so worth it! So there’s a book for everyone, but is there a person for every book? I used to argue that the answer was yes. 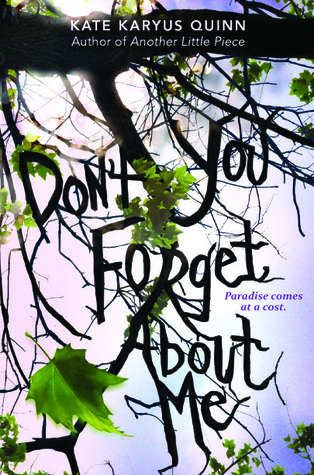 Then I read Don’t You Forget About Me, by Kate Karyus Quinn. Here’s the gist. The action takes place in a sort of paradise. People come to cure their illnesses and live long, pain free lives. That’s all well and good, except that every four years, teen hormones go out of whack and eventually one teen causes extreme death and destruction. But that’s the price you pay for paradise. Four years ago, it was Skylar’s sister leading the way. Now it’s another fourth year and Skylar is doing everything in her power to forget the pain and fight the urge to follow her sister. There are paranormal powers, a mysterious founding family story, and a powerful asylum that forces the criminalized teens into weak shadows of their former selves. It sounds intriguing enough, right? This book was screaming for me to like it. It’s named after my favorite 80’s movie’s theme song, the chapters are similarly titled after 80’s pop songs, and it’s advertised as a novel about paranormal teenage crime. Add in the fact that every time I look at the cover, I immediately start singing the Barden Bellas’ finale performance from Pitch Perfect (which always makes me happy), and this should have been a home run. Unfortunately, it was anything but. Skylar takes special forgetting pills to numb her pain. They’re effective to the point that she forgets how to perform basic human functions. They’re ineffective to the point where every piece of information needs to be spelled out to her, and indirectly to us, about twenty times. The story isn’t chronological, which acts to give the reader some of the trippy side effects Skylar experiences, but is actually just frustratingly dull. The out of order timetable is also supposed to heighten the mystery and make us want to fill in those missing pieces. But when we get those pieces, they are nonsensical and anticlimactic. Spoiler alert: they’re rats. RATS. The missing pieces are MAGICAL EVIL RATS THAT CONTROL PEOPLE. I wanted to stop reading this book so many times, but annoyingly I did want to know the answers to the mysterious beginnings of the paradise town. I don’t have social media FOMO (fear of missing out), but I suffer from severe literary FOMO. I have a very difficult time abandoning a book once I’ve started. In this case, however, I wish I had dropped it. Such potential with all the great 80’s references! I had to stop reading “The Paying Guests” recently, it was a struggle as I realized they style was too haphazard after I’d invested about 150 pages of it. Sometimes you just have to google the resolution and move on! Aww, I’d heard such good things about The Paying Guests! Sorry to hear it didn’t work out for you.